My husband and I are usually big trip planners. Sadly, we have missed the boat, plane and probably train when it comes to spring break, which begins in 18 days. We looked into Ixtapa in January, but then that Calgary woman got beat up in Mazatlan, so we decided on Jamaica. You have to fly through Toronto though, so we looked stateside instead, to Arkansas. The airfares jumped on that one, however, so we set our sights on Tucson. 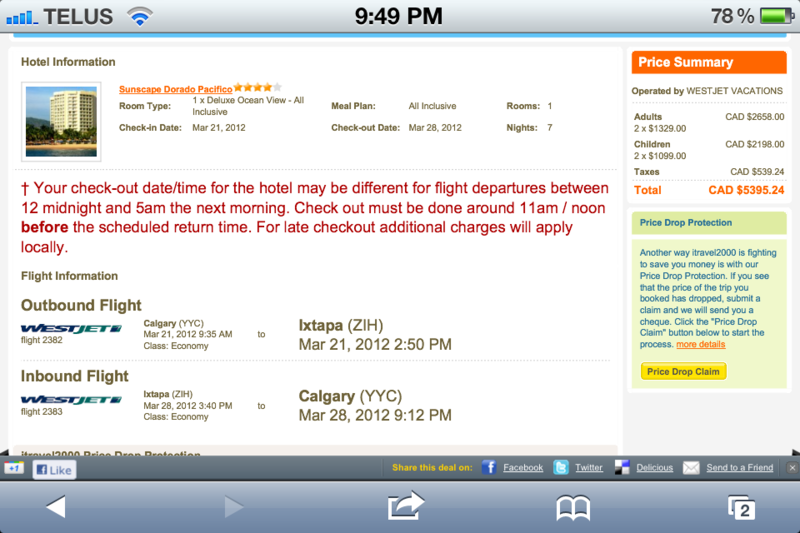 Who knew it’s impossible to fly there from Calgary for less than $700 and with fewer than one or two stopovers? Now, less than three weeks out, we are once again eyeing Ixtapa. To get 5-star for $1,000 per person — all in, plus airfare — sign me up! Immediately after reading this review we clicked on the “verify” button, and were shocked when the total on our dream vacation for four suddenly jumped by $1,500. We’d done the math and were prepared to pay just over $4,000, not $5,500. Incensed, I called iTravel 2000 to have an agent explain the price difference. Were we missing something? Sure. Right. Whatever they coached you to say at scam school, buddy. We then checked Sell Off Vacations and also the WestJet site, and each one showed the mysterious price “jump” when we clicked on “Book.” Um, can you say price collusion (or, false advertising)? So now, 18 days away from spring break and still with no plans, we have a new strategy. (No, we will not look at 3-star properties! Nothing but the Sunscape Dorado will do, baby.) I’m going to check the sites daily for a two-weeks-out price drop that a Flight Centre agent assured us will happen. Wish us luck! How about you? 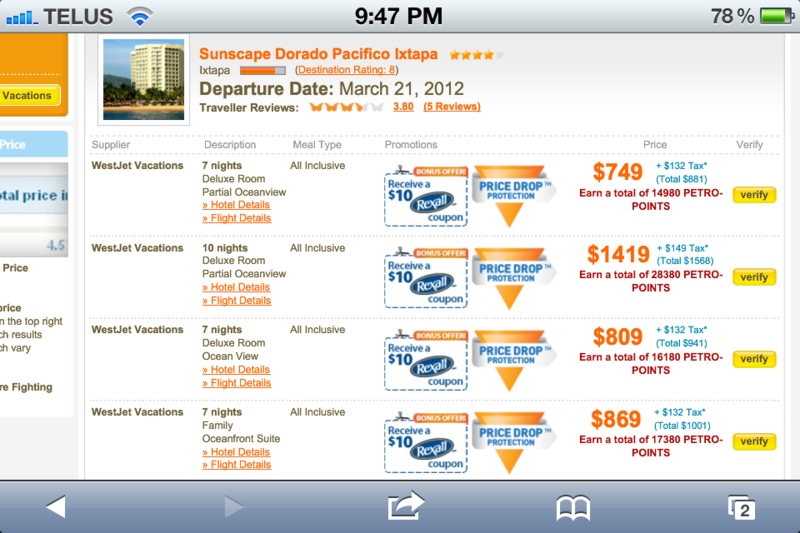 Have you ever experienced this kind of price discrepancy on a travel website? This entry was posted in Potpourri, Travel and tagged family travel, Ixtapa, last-minute deals, Mexico, online booking, spring break. Bookmark the permalink.